How is BigMailer Different From Other Email Marketing Platforms? There are hundreds of companies offering email marketing solutions these days, so why choose BigMailer? There’s a long list of reasons, starting with a startup friendly free tier (<5,000 contacts free), affordable pricing that’s friendly for scaling up ($1 per 1,000 contacts), and agency friendly built-in brand/user management. But since we didn’t set out to just compete on price, here’s a list of features that we think makes BigMailer an attractive option for many businesses. Using different providers for your bulk (MailChimp, CampaignMonitor, Aweber) and transactional (SendGrid, MailGun) campaigns is so 2008. You pay more to different providers to engage with exact same list and you have to do more work on top of it – manage and sync up your bounce data and analyze your engagement rates. Your transactional email shouldn’t be managed by developers but be a part of your integrated marketing efforts. With BigMailer, you can manage all your email campaign types on a single platform, so you have a single price point and your engagement data is centralized. In other words, you have a unified customer view when it comes to engagement with your brand. You can initiate email sequences based on your transactional email activity or engagement. Example: A user creates a member account on a website or starts a free trial, the back-end triggers a welcome email with next steps and usage tips, and an email sequence you define gets initiated based on the transactional email. Most market leaders don’t even offer the option to manage multiple interest-based opt-ins, and those that do (CampaignMonitor, and AWeber) price it as a multiplier of typical rate x number of opt-ins you want to manage, pricey! 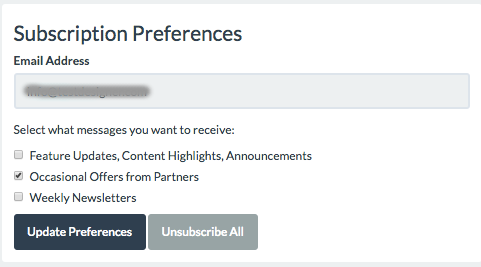 What does a BigMailer unsubscribe page look like with multiple interest-based opt-out options? Below is a screenshot of the unsubscribe page for one of BigMailer clients with over 500k contacts on their email list. Why is this important? Interest-based opt-ins allow your customers to unsubscribe only from those emails they don’t want to receive and keep receiving those they want to receive, instead of opting-out from all communications from your brand. With BigMailer, you can configure unlimited custom senders – sales@your-brand.com, support@your-brand.com, no-reply@your-brand.com – you get the idea. When your customers receive an email sent from BigMailer, assuming you configured things correctly, they will only see the from email address in the header and nothing else that points to your provider. This can help your email deliverability, since the sender is actually the sender, not some 3rd party server, and makes any future migrations headache free. Ok, so features #4 and #5 are offered by some providers, those that charge you more for using their platforms. BigMailer offers this feature on all plans while being 50-500% cheaper(depending on your list size) than market leaders. Since IP address of customer is considered PII (Personally Identifiable Information), BigMailer does NOT store any IP addresses for your customers – we simply convert it to non-PII data points we can store like country, state, city, zip and allow you to target your campaigns based on this data. Why do we require our customers to connect their own Amazon SES accounts to BigMailer? Traditionally, email service providers have been managing their own servers and infrastructure for sending emails, which meant managing and monitoring reputation of their shared server pool. This approach is very expensive, but also results in customers being turned away if their lists are determined to be not of desired quality. BigMailer uses Amazon servers to actually send emails out, while providing an interface to manage campaigns and analyze performance data. This approach allows us to pass the savings to you, our customers. Since our customers connect their own Amazon SES accounts, the rest of the BigMailer customers are never affected by anyone’s bad lists or behavior. That means no compliance departments at BigMailer to police our customers so we can focus on making the best product we can. There is of course a bunch of other cool features, like built-in brand management, list suppression (opt-out data from any cross-promo campaigns you may have done with your partners/affiliates/vendors). We don’t offer hundreds of pretty templates, because any serious marketers (like you) already have their own email templates. And if you need a nice template or two, there are a tons of free responsive html templates you can grab and customize. Need other features you want to see in BigMailer? Request them in comments or contact us directly. We appreciate any feedback you have for us.